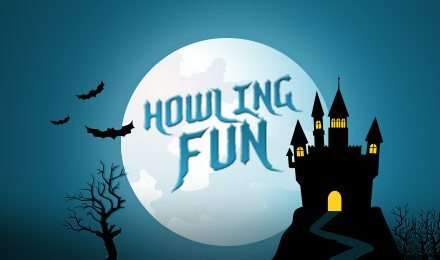 Spin to win Howling Fun Slots if you dare! Celebrate Halloween anytime you want in Howling Fun Slots at Wicked jackpots! It's spooky but it's worth it. There are 2 Scatters, a Devil Wild, FREE spins, multiplied wins and a Prize Pick bonus! What more could you want?! Get ready for a howling good time when you play this spooky Halloween themed online slot game at Wicked Jackpots! The reels are full of cackling witches, Dracula symbols, castles and more! The Devil represents the Wild, and will appear on reels 2 and 4 to reward you with doubled wins. Your first Scatter is the Castle, and 3 or more will grant you at least 5 FREE spins. The second is the Mummy, and spinning 3 or more will trigger the Prize Pick bonus where you can get extra coins! Don't be scared. Spin to win today!